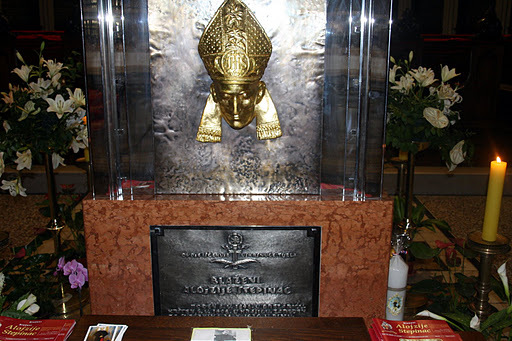 28th of December 2011: Two Roman Catholic Churches in Croatia held memorial masses for Nazi-leader Ante Pavelic. This is not the memorial mass, but the present Pope kneeling in front of the beautified Nazi area Bishop of Croatia, June 2011. The Nazi legacy lives on. 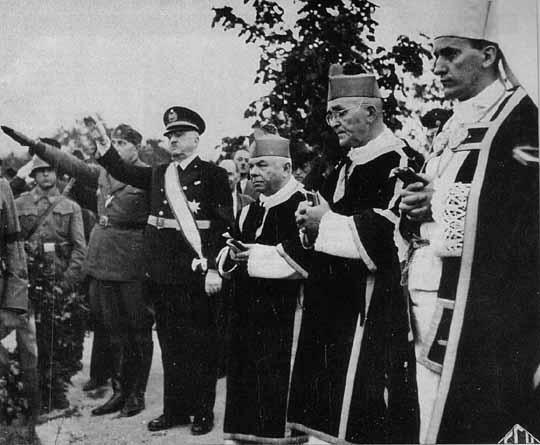 The Simon Wiesenthal Center condemned a memorial Mass in two Catholic churches in Croatia for Ante Pavelic, the fascist leader of the country under the Nazi regime. The Mass, held Dec. 28 in Zagreb and Split to mark the anniversary of Pavelic’s death in 1959, “is a disgrace for the Croatian people,” Efraim Zuroff, the center’s director in Jerusalem, said in a statement. He called on Croatian authorities to ban commemorations of Pavelic’s death. Under Pavelic’s Ustasha regime during World War II, hundreds of thousands of Serbs, as well as Jewish and Roma civilians, were imprisoned and murdered in Croatian death camps. Zuroff called the Mass “a total ridicule of Christian values” and an insult to Pavelic’s victims. Source: JTA, Jewish News Agency. 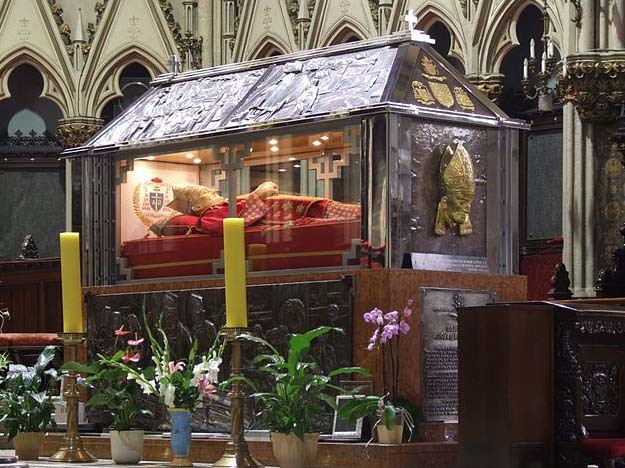 The Roman Catholic cardinal is beautified and adored as a fake wax figure. Some saints are kept on chemicals, and painted in silver. This Croatian has a golden look. This phoot is intereresting. Because the lady who wants to kiss the glass coffin has just discovered the red shoes of the wax figure. 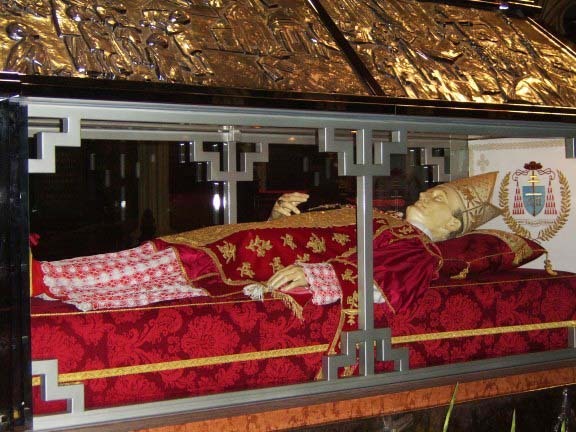 The death mask that hangs on the glass coffin is also golden in color. Was the Roman Catholic Church silent on Nazism before and under World War II? This is a matter of dispute. Disputed, because the Vatican have not opened its war files. The files in Berlin were destroyed. The Vatican relations with the Nazi proxy regime in Croatia, expose the nexus. Not only were the Roman Catholic priests and bishops active supporters of the Pavelic-regime. Even today the Roman Catholics in Croatia hail the memories of the Nazis. The late Pope has done his best to please his subjects in Croatia. 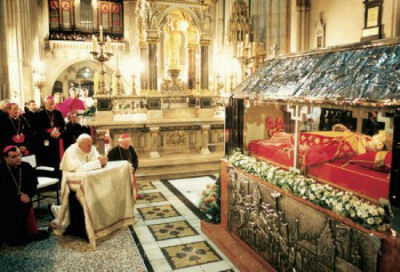 John Paul II beautified the local Cardinal Aloysius Stepinac who hailed Pavelic. 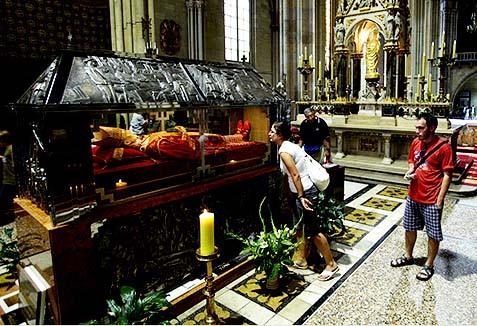 The Present Pope kneeled and prayed in front of the wax corpse of the beautified bishop during his visit to Croatia 4th of June 2011. 87,8 of the population in Croatia are Roman Catholics. This is what Wikipedia has recorded about Nazi leader Ante Pavelic and Bishop Stepinac. During World War II, on 6 April 1941, Yugoslavia was invaded by Nazi Germany and its allies. The (Allied) Yugoslav forces maintained a defense up until 17 April. On 10 April 1941, the Wehrmacht occupied Zagreb. Having previously agreed to form a Croatian satellite, the Germans and Italians established therein the Independent State of Croatia, and installed the Ustaše movement into power. Fiercely nationalistic, the Ustaše were also fanatically Catholic. In the Yugoslav political context, they identified Catholicism with Croatian nationalism and, once established in power, set about persecuting and murdering non-Catholics. As the archbishop of the capital, Stepinac enjoyed close associations with the Ustaše leaders. Stepinac publicly exhorted his hierarchy to pray for the Independent State of Croatia, and publicly called for God to “fill the Ustaše leader, Ante Pavelić, with a spirit of wisdom for the benefit of the nation”. 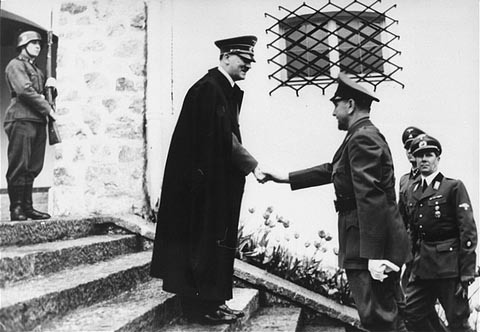 Ante Pavelic visits Adolf Hiter in Berchtsgarden in Bayern on 9th of June 1941. 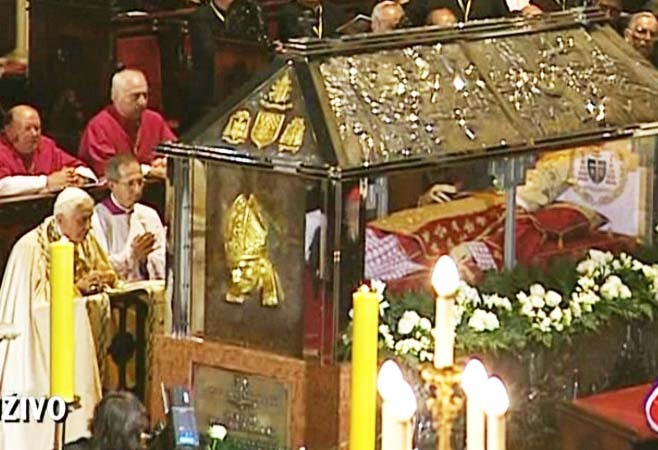 Pope John Paul II, surrounded by Roman Catholic clergy, praying in front of remains of Aloysius Stepinac, responsible for the genocide of 750.000 Serbs, 60.000 Jews and 30.000 Gypsies massacred in the name of religious purification. The Pope beatified Stepinac in Croatia on October 3, 1998. 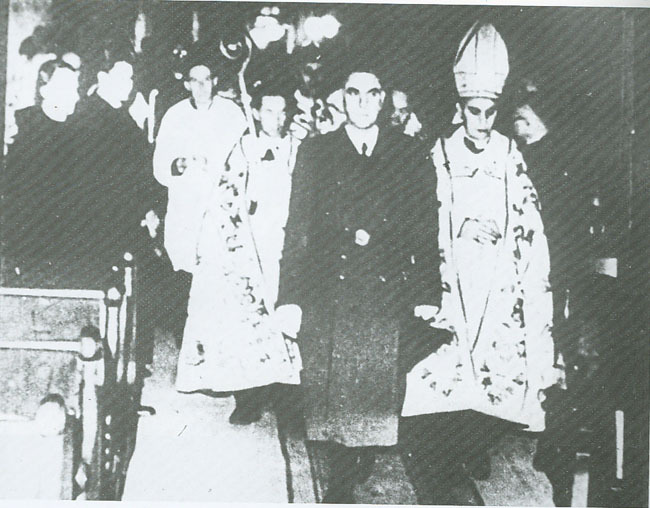 Pavelic and Stepinac attending Roman Catholic mass together (1942). 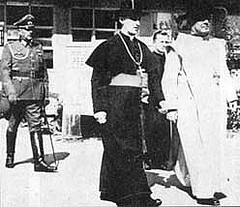 Archbishop Stepinac and the papal nuncio Marcone leave a celebration; behind them is a German General. Late Pope John Paul II beautified the Nazi-area Bishop in Croatia. John the Apostle saw the first Messianic Jews being massacred, and taught that the last hours were there. He thought is could not get much worse. It could. First published, Desember 4th, 2013. The old whore in all her glory! Jeg har nettopp sendt saker om dette, pluss sviket mot det serbiske folket i forfalskningen av massakren i Srebrenica til Norge IDAG. Vil du be om at de våger å trykke dem? Shalom, og godt nytt år. At masakren i Sebrenica har blitt forfalska er ukjent stoff for meg. Har du ein link? Thank you for the text about the mass for Pavelic. I come from one of the ex Yugoslav countries and I am familiar with what happened during second World War in Croatia to non-catholics. Is it is possible to get a translation of Lars-Toralf S. comment and yours above please, cause I would like to hear what does he say about Srebrenica. I have to say that I see you know about this issue (Croatian nacism) quite a lot. Thank you. There is no secrets in my shot communication with Lars Toralf. I just questioned Him to give me a link to a claimed fabrication of the Srebrenica massacre. I am not aware of this kind of fabrications, but have always trusted the information given by the Bosnian government, the UN and NATO. I notice that propaganda on the 1940-1945 is believed by the blogger. May he than be thankful to me also, for pointing out, that Adolph Hitler was a Roman Catholic, that Adolph Hitler would sign a Concordat with the Vatican in 1933, as soon as he was in power. I will surely be thankful to you, also….For commenting on this blog. But I wounder what kind of propaganda “the blogger” has published from the “1940-1945”? Kindly explain this to me, so I can correct my self. When I read your comments, i understand that from the conspire theorists camp, I am a quite liberal critics of the Vatican. Good to know. Off course Dresden was not the only city that was bombed…. If Dresden was the only city that was destroyed, there may be were something in your theory. But unfortunately, two million Germans were killed during the Bombers command carpet bombings of Nazi-Germany in 1944-45. The fireball’s that destroyed larger sections of Hamburg, killed more people than in Dresden. Also the people of Berlin, faced an allied massacre. The US and UK bombed the city from the air, and Russians slaughtered the Germans on the ground. All wars are a horrible crime against humanity. I agree that the attack on Dresden, was a war crime. There was no justification, other than pure revenge for the blitz on London. Dresden was poorly defended by German air defense system. The city was raped from the air. So was the US nuclar attack on Hirosima. Any Jesuits involved in that bombing too? Well, there’s theory that at the time, there wasn’t atomic bomb which could be deployed by any plane yet. The device had to be build on the spot, bomb dropped from the plane served as detonator. From little I know about nuclear reaction, I know, that atomic explosion involves two explosions in fact. First one (must be very powerful) ignites nuclear process, which is the monster as we know. Since it wasn’t deployable by plane at the time, which is quite possible but not necessarily true, there had to be people on the ground in Japan. It is known though, close to epicenter of 1st atomic bomb survived 1 woman and 4 Jesuit priests, one of them scientist. Another important fact, is that British and other Western Asian troops where shocked by the massacre of Southern baptists at Omaha beach at D-Day 1944. The top military of the American Army would use the opportunity to kill American non-Catholics. I did not know that there ever have been a census done, over the fallen US soldiers on Omaha beach. In fact, this is one of the most ridiculous statements I have ever read. And believe me: I have read a lot of strange stuff. Do you really believe that German Nazi-General in Omaha, Normandie, got a list over Southern Baptists from the US generals? And that this list included where these young soldiers were told to run on the beach? If you do not know about Omaha Beach in 1944, you might not understand what I try to convey. I am not sure you are completely “with us”. I will spam all the comments you have published so fare. I have never done that before, but it is for your own protection. I will look for your comments in the spam filter. If I see some repentance, I will permit you to continue. Please reply if I address you. This is a comment field, and the spam button will be used when it is necessary. Keep in mind that Jehovah Witnesses and Latter day saints, (Mormons) do not use crosses. How dare you write that? Off course he (Alojzije Stepinac) was a war criminal. In Jasenovac in Croatia there was a war camp like Aushwitz, except in additiion to Jews and Gypses the majority of victims were Serbs and Montenegrins (orthodox Slavs). The plan of the Nazi Croatia was to get rid of the ortodox people living in its territory by either killing them, forcing them to accept catholicism or drive them away (the lucky ones). Unfortunatelly even today there are many followers of this ideology in Croatia. Rome has always been anti-semitic. It was the Romans who performed the first holocaust that killed somewhere around 10 million jews. That happened shortly after the fall of Israel and the destruction of the second temple in 70AD. Then there was countless other jews killed during the crusades and inquisitions. Hitler even found inspiration from what used to be commonly known Catholic history of ghettos, yellow stars and camps. Now you have to dig deep and hard to find that recorded history. You will face great persecution for trying to expose those crimes in this day and age. It is a fact that Hitler modeled his holocaust after Pagan Rome and the Roman Catholic Church’s persecution of the jews. Hitler also worked with arab muslims who wanted to help destroy the jews. The book “Petrus Romanus” by Tom Horn and Cris Putnam does a decent jobs at explaining all of this. what business does the Simon Wiesenthal fraudulent Nazi hunter centre have with any business of the Roman Catholics? I have just read in one of the West Balkans internet sites that Pope Francis is planning to declare Stepinac a saint (or whatever is the right English term for this) by the end of the year 2014. Also Hitler’s Pope will be granted the status as “saint”. Pope Pius XII.